Rap star Kanye West has called for an end to homophobia in the hip-hop community. He said hip-hop was always about "speaking your mind and about breaking down barriers, but everyone in hip-hop discriminates against gay people". "Not just hip-hop, but America just discriminates," the Grammy-winning artist said in an MTV interview. "I wanna just, to come on TV and just tell my rappers, just tell my friends, 'Yo, stop it'." Artists including Eminem, DMX and Ice Cube have been targeted by gay rights campaigners for having homophobic lyrics. West admitted he developed anti-gay views when he was young after being called a "mama's boy". "And what happened was, it made me kind of homophobic, because I would go back and question myself," he said. But he had a rethink after discovering one of his cousins was gay, he said. "It was a turning point when I was like, 'Yo, this is my cousin. I love him and I've been discriminating against gays'." 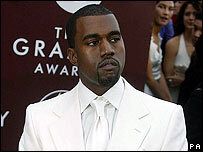 Atlanta-born West, 28, won best rap song and best rap album at this year's Grammy Awards. The MTV show, All Eyes on Kanye West, went out in the US on Thursday.